The Beach Interfaith Outreach Lunch Program has been operational for over 15 years, offering food and fellowship to any person in need. Founding coordinators Arie Nerman and Diane Thomas knew that even a community surrounded by opportunity and advantage had marginalized and disenfranchised individuals needing to be recognized. Arie, particularly, embraced the concept of making each location an environment of non-judgment and solace. Today, it is still a unique co-operative of volunteers with the same vision of “call to serve and act” regardless of differences. In fact, it is the similarities which unite us. 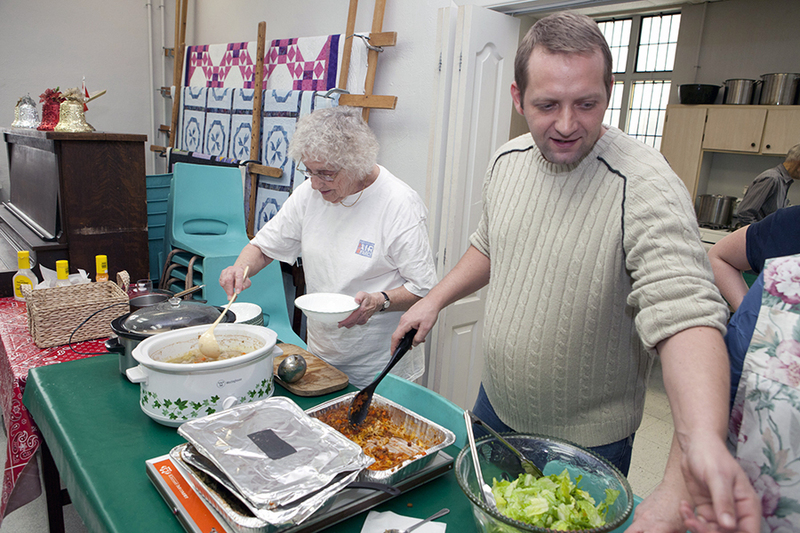 Six faith groups open their kitchens and dining halls to guests from all walks of life and serve them soup and sandwiches. Adults struggling with life issues, seniors on a very fixed income, lonely people needing human contact and conversation, and others all seem to enjoy and appreciate this invitation. Many of you reading this will know first-hand how rewarding – yet challenging – it can be to effectively manage a non-profit program. Just once I would like to report that there is enough food, money and manpower to operate our program without fiscal concerns. But everyone knows that the needs are increasing while funding is decreasing. Multiply this by five locations and 28 weeks, add yearly incidental costs like training and membership fees, and I think you can see where this goes. Furthermore, there is no government funding for any aspect of our program. It relies solely on donations from faith groups, some businesses (Cobbs Bread and Starbucks) and other occasional donors. This means we need help. Now, we are not asking that our volunteers be paid, nor that our locations to be reimbursed or even for the majority of our food costs to be paid. We are asking that anyone interested in helping to defray the very real costs to this valuable program (membership fees, training and delivery costs) please contact Suzanne Beard at sueatthebeach@hotmail.com. Suzanne Beard is the Beach Interfaith Outreach Program co-ordinator.